Learn how you can leverage social selling tools to deepen relationships with prospects. Astute sales people have always watched the news. A press release, merger or a hiring announcement was often an indicator that a prospect could be looking for a solution. A sales person could snap up the opportunity by being the first one on the scene. Today, however, 98% of top sellers credit their success to building a relationship with their prospects, not cold calling at the perfect time. That’s because in this information age, most customers make 57% of their purchasing decision before they even engage with a seller. To develop relationships with prospects, sales people have shifted their focus to social selling. But do not despair, news hounds: good news about a prospect (or their company) still represents a great opportunity for the savvy social seller! 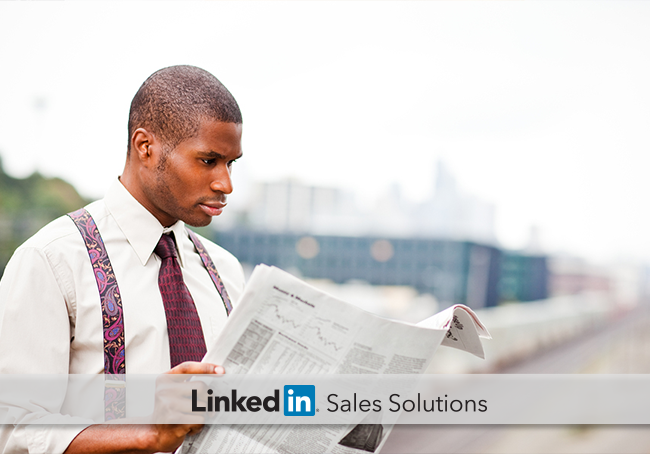 Watch your prospect’s LinkedIn feed to see when they share articles, news or press releases. If you use Sales Navigator, you can see the news and shares of your Saved Leads, as well as news posted on the Company Page. When you see relevant good news, share it as a Status Update on your LinkedIn profile with a short comment about why you find it interesting. If you’re already connected to your prospect, use LinkedIn’s mention feature when you publish the update, so they receive a notification about it from LinkedIn. That way, your prospect knows you’re celebrating with them – and have value to add to the conversation. You’re likely a member of several LinkedIn groups in your industry. When a prospect makes the news, use it as an opportunity to celebrate their success while positioning yourself as an expert. To do this, share the article about your prospect’s good news and write a memorable comment that adds additional insight and starts a discussion. How is your prospect’s news a fascinating example of best practices in your industry? How does the good news change your perspective? What are 3 reasons you believe your prospect’s initiative was so successful? End each comment with “What do you think?” (Or some other phrase that invites others to chime in.) This keeps your group post thought-provoking – not promotional. When you see good news about a prospect or company, it’s a great opportunity to warm up your relationship with them by sending a short message of congratulations. According to Viveka, most salespeople don’t take the time to craft a well thought-out message – so doing this will help you stand out. Give a Reason to Open the Message in the Title. “Hello” doesn’t cut it --“Read the article about you in Fortune.” is much more intriguing. Keep it Brief. Congratulate your prospect on their good news, but don’t go overboard. A couple sentences will let your prospect know that you noticed their achievement. Invite Them into the Discussion. If you’ve shared their good news, mention that their news is getting a lot of attention and you’d love to hear their perspective. Make it easy for them by sharing a link to where the conversation is taking place. When your prospect has good news, it’s an opportunity to reach out and deepen your relationship with them. The more you can connect with a prospect without an obvious sales motive, the more likely they’ll be to reach out to you for advice, questions and/or when they are researching solutions for their business. That way, you can be part of their decision making process right from the beginning.